I was trying to introduce my husband to some of the animation I used to watch as a kid. I played some videos on Youtube of Nelo and the Dog of Flanders , and I was trying to tell him the part where Nelo and his grandpa were evicted from their home because they were unable to rent. Aren’t they, I said to my husband, kawawa? To which my husband replied, Kawawa? No. If they can’t pay the rent, then they are the bad ones. Well, my husband, that’s hardly the landlord’s fault, is it? To be honest, I couldn’t remember the circumstances of Nello’s eviction- whether, indeed, it was justified or not- but I do remember feeling really bad about Nello and I wanted my husband to feel the same way. For him to sympathize and empathize. However, my husband’s comment threw me off-guard. This isn’t just his words, of course. This is a reflection of the type of culture he was raised in, it’s practically common sense. Now, some years later, I have a property myself – earned and worked for, mind you, not inherited or (s)mooched off my parents – and I have more in common with the evil and vile character of my favorite animation, the landlord, than the hero. Let’s get real. If a starving artist fails to pay me rent, I will evict him too. And I don’t need to justify myself to anyone – I earned this property. It’s a business, not charity. But in the Philippines, I will be considered evil and vile. Because pity is always on the side of the poor, the starving, the dukha, the homeless. People’s sense of right and wrong depends on many factors. It’s never just a simple ‘right’ or ‘wrong’, nothing straight forward. It’s complicated. What does the person look like? Is he young, is he old? Is his family dying? What pushed him to do what he did? Sometimes, it’s good to look at all these factors. But most of the time, it’s bad. Our society encourages us to think with our hearts, to have mercy on others instead of using our heads. Back in my college days, there was at least one serious incident per year, an incident that involved a UP student and at least one ‘outsider’. By outsider, I don’t really mean outsiders. I mean non-UP students who were loitering within the campus, or worse, living within the campus. I remember a batch mate being stabbed at the Palma Hall Parking lot and dying in the arms of his girlfriend. Another boyfriend of an acquaintance died after being mugged. And yet a third acquaintance was beaten and raped. The stories were not urban legend : some of the victims were personal acquaintances; some talked about it themselves. The female victims talked about their encounter (the rapes and attempted rapes) during the ACLE (alternative class learning experience) as a part of their ‘therapy’ session. Regretfully, I had to stop my afternoon run around the acad oval in fear of being the next victim. It seemed that evil doers roamed the campus even during the day. One female jogger was attacked at 7 am in the morning! Finally, the incidents were becoming more frequent, and there were calls to evict illegal settlers in the campus. It only seemed right and fitting, wasn’t it ? After all, our second home, our school, was becoming more and more dangerous. But some of my schoolmates replied with a big resounding NO. It’s a simple matter of right and wrong, legal and illegal. But Filipinos have distorted everything by injecting pity and mercy to people who don’t necessarily deserve them. Back home, I was channel surfing when I chanced upon the documentary on EDSA. 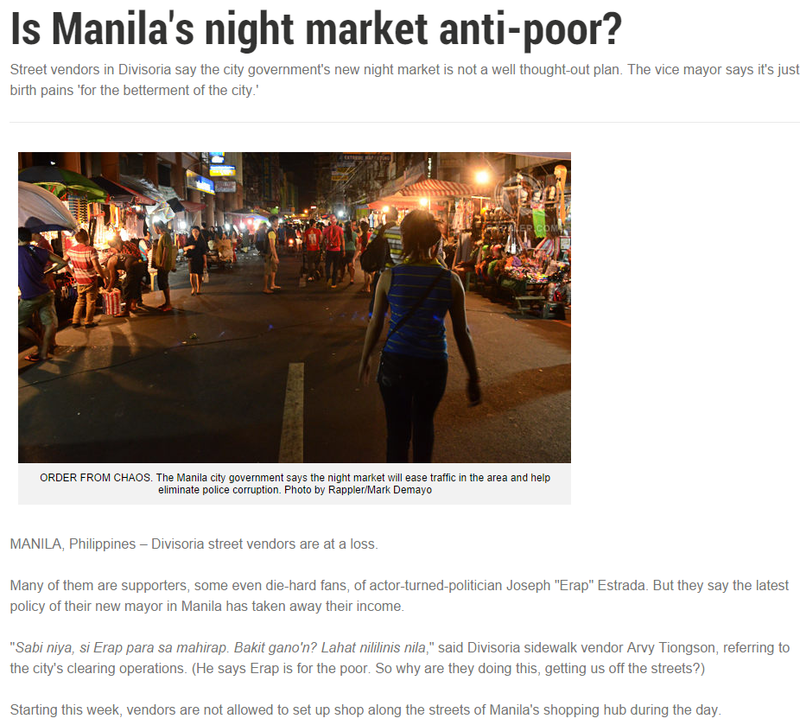 Among causes of congestion in certain parts of EDSA was, unsurprisingly, the street vendors obstructing the road. It ‘s s just a matter of common sense. 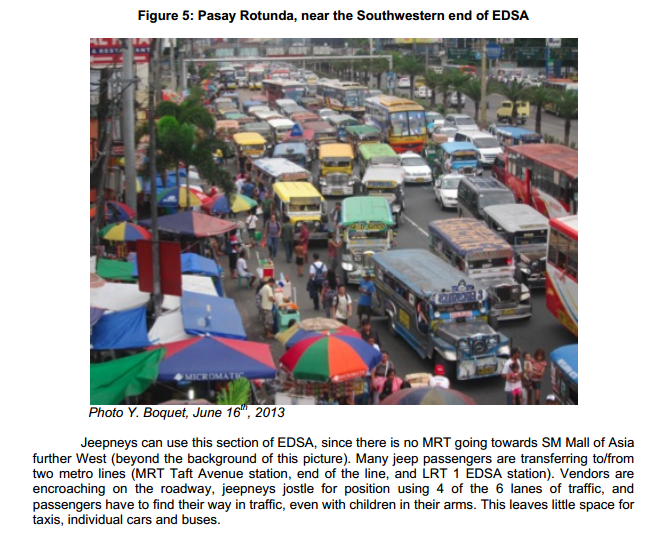 EDSA is a road made for cars and pedestrians. It wasn’t built to be a tiangge or a market, not a place to eke out a living. If this happened in Japan, the government would raze these stalls to the ground and arrest the vendors, who are – and let’s not mince words here – breaking the law. But then, Japan is a country with a clear(er) sense of right and wrong, where car dealers are prohibited by law from selling cars to people who don’t have proof of registered/ paid parking lots. And the Philippines is the land of the kawawa – and will stay that way unless we get our heads out of our assses. For once, I have to say Kudos to Erap. He’s finally doing something right. Unfortunately, not everyone agrees. Look at the way Rappler positioned its article, using the same techniques the pro-illegal-settlers in UP employed to appeal to the students : by interviewing one person at a time and getting up close and personal. The kawawa factor. I don’ really get how something lawful can be ‘anti-poor’. Before you adopt the skewed thinking of the kawawa sympathizers, try to step back and analyze the situation. I mean, don’t poor people use the roads too? When you clear the roads, you do more good to more people by making their travel more convenient and less of a hassle and their commute shorter. But when you allow the tinderos and the tinderas enroach the streets, you favor the minority. By letting a select minority monopolize public space, you fail to make most of what the road was made for, and whom it was made for : you become anti-poor. 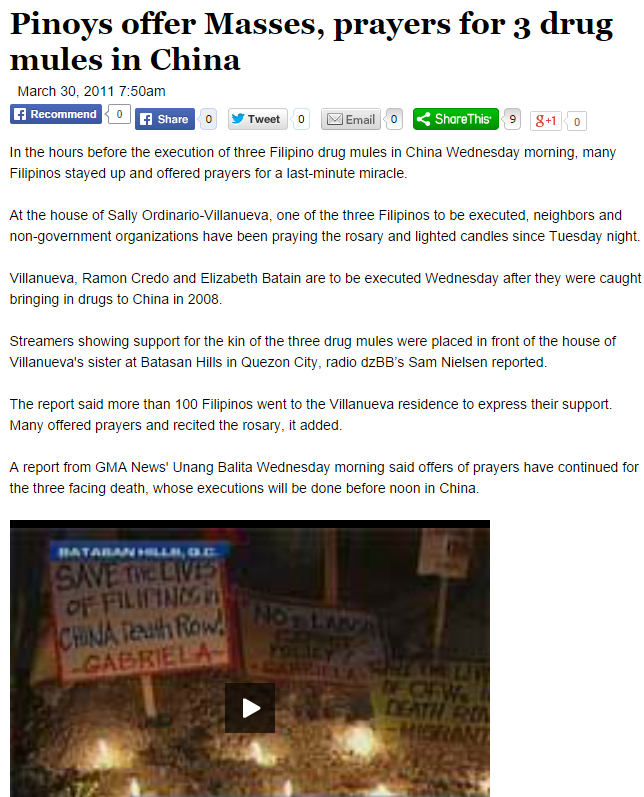 This is what I don’t understand : why do Pinoy drug mules get so much sympathy from the people? Why are they considered kawawa? It’s just wrong in so many ways. First, doesn’t it send the wrong message, not only to our fellows, but to the world? When we send a delegate, a government official, to beg in behalf of the suspects, it seems to say, Yes, we tolerate these scums. We tolerate wrong doing. We tolerate drug trafficking. Second, it discourages accountability. When we say, ‘eh kasi, mahirap lang siya, kaya nya nagawa yun‘, we are making excuses for people to do wrong, as though they were mere victims. Poverty doesn’t justify drug trafficking, or any crime for that matter. They were drug mules. Call a spade a spade. They were breaking the law and they knew it. By absolving them of their crimes, by attributing it to ‘circumstances’, we are taking away their freewill, their ability to decide for themselves, we are affirming that they were indeed powerless to decide otherwise. The next person who’s thinking of committing a crime, might think to himself, bakit, ako din ay victim of circumstance. Ako din, kawawa! Third, it promotes the wrong values. It encourages people to do wrong, because the Philippine government will be by your side anyway and the citizens will be offering you prayers. Aside from that, your family could also get compensation / assistance from the government. Fourth, China shouldn’t be persecuted for upholding their own laws. We don’t have laws? That’s our fault. But they have laws and they want to send a clear message to everyone. 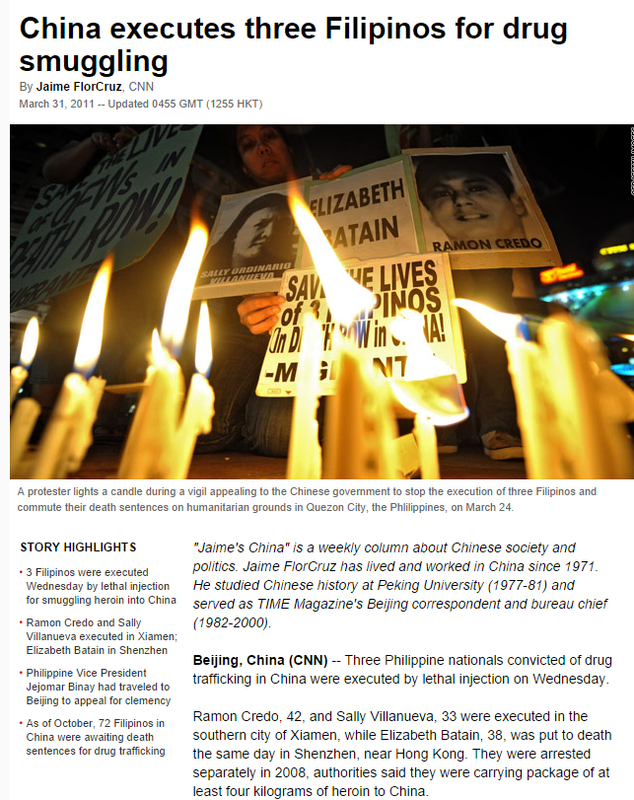 Fifth, before the drug mules were executed, some people were clamoring to execute the Chinese drug lords in the Philippines, as if they were bargaining chips. As if to show China we can be heavy handed if we wanted to. It almost sounded like blackmail. But I think we’d be doing ourselves – and China – a big favor if we executed all the drug lords and drug mules, regardless of the color of their passports. Drug mules aren’t kawawa at all. A drug mule is a drug mule is a drug mule. I’m sure China would go, “kill ’em all!” Do we actually believe a country with a billion people will shed tears for a drug lord? Note : Of course, being falsely charged of being a drug mule is another story. I was talking to coworker about our schedules one day, and he mentioned he doesn’t work on weekends. To which I replied enviously,’Wow, lucky !’ And he said, ‘It’s not luck, I chose this schedule.’ I have to agree: it takes more than luck not to work on weekends; in our industry, it has to be a choice. Our schedule is how we chose it. Our lives are how we shape it. We have more power than we think. I work weekends -I am not kawawa. I chose this. And I must suffer the consequences. Or reap the rewards. I can continue and state more examples to make my point, but alas, I have to earn my living. The point is, this kawawa thing is often misdirected. Sure, there are kawawa folks everywhere – specifically those who died unjustly. But most of the time, it is used generously to people who don’t deserve them, people who could have done otherwise. In that case, it is disempowering. When a father of seven cries injustice in the face of hardships he is facing, let’s not completely disregard his own freewill involved in producing all these kids. They didn’t end up on his doorstep one day. Nor did we point a gun to his head and force him to reproduce. If he is man enough to father all these kids, then be man enough to support them. Now that he is living in the shack by roadside with his starving kids (Eraserheads, anyone), hating his life, he mustn’t blame others for the life he is living. I am [still] childless by choice. Why should I feel awa for those who didn’t have the sense to hold off (or forego)kids ? Kawawa invalidates free will and the power to change the course of our lives. It’s why we can’t think straight, why we can’t get things done. Roads are for driving, universities are for learning. It’s why we can’t tackle issues head-on, and come up realistic solutions to our problems. It’s why there is almost no accountability, no respect for laws, and explains why we’re willing to let people off the hook easily. Matanda na kasi, kawawa naman. Mahirap lang kasi kawawa naman. Bata pa kasi, kawawa naman. There are rules! You break the rules, and this whole goddamn thing of ours cracks and crumbles! You never break the rules. Capiche? Now this thing of ours is cracking and crumbling because we break all too many rules, in favor of the kawawa. And kawawa we shall remain. Positively a must read, and I shall post it as such in my right column. I am reminded of the recent outcry in Spain when the dog of a Eubola victim was put to sleep for possibly being a carrier of the disease. The contributions poured in. For the dog. There is a severe disconnect between heart and mind in many ways in the Philippines. The upside down view of right and wrong is actually written into Philippine family law, or the right definition is omitted from laws, so that it is hard to eject people who just move onto your property. And I cannot evict my wife’s mother from our property even if she is busy cooking meth in the dirty kitchen instead of manok. The law says I must take care of her for life, and she has a more prominent right of ownership than I do because she lives here. I only paid for everything. Thanks for the comment. And thanks for sharing. I’m tired of people making excuses for people who are defined as ‘kawawa’. We let them get away with one too many things, and if this keeps up they’ll take us down with them on that sinking ship. And I agree – we should change some rules/laws that excuse criminal behavior because the perpetrators are kawawa. Like the one being too old to be incarcerated. come on! Not enough “Kawawa” is holding the Philippines back. Like you say, “kawawa”is often misdirected. In all your examples, safe for Nelo, I don’t feel any “awa”. When I looked on the inside of my eyes it gave me the a reason. 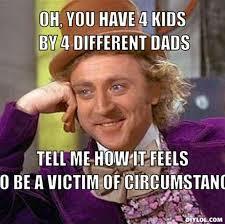 One has to know the circumstances. In nearly all examples the law was broken. Not only the official law of the country but far more important, my own rules of ethics. Not only do I not feel pity with the drugs mules, I curse them and wish them dead. People that are instrumental for the drugs addictions of others don’t deserve a place on this earth. I don’t feel pity with the father of seven, but I do for the children. They did not chose this life. Can I help them, probably not. Together with my wife we made it a point to help those who can and are willing to help themselves. Over a period of 40 years we were able to give a little help by starting up business or schooling. Yes, more than once we were disappointed. But there were successes as well where the business run well and the kids were able finish their education and find a job. If there would be a little more more “kawawa”in the Philippines life would be better for a lot of folks. Do you think the Marcosses, Napoles, Estrada’s, Arroyo’s etcetera showed enough “awa” when they stole the (b)millions. Or maybe the tens of thousands of known and unknown other PNP or Government officials that steal from the people. What to think of that rich employer, with 3 mansions, 6 cars and millions of pesos on the bank, don’t want to raise the daily income of his employee with 25 pesos up to the legal minimum salary standard because it might affect his company. Or do you think that a-hole that robbed a 11 year old boy in Caloocan from his daily earnings of 200 pesos, showed any “awa”. Or does the brother of the OFW show any “awa” when he quits his job because his sister is sending money. Even though “awa” is primarily from the heart it won’t do any good to others if not in cooperation with the brains. Being without money(poor) is not bad. There are considerations to make, what is he doing to improve. How many changes did he have. What were the circumstances. Did he have influence on his situation. Are we going to blame Yolanda victims for choosing the wrong residence or the 1 year old Tondo baby that it is own fault. I believe we are not on this world just to gather more and more materialistic properties. We are a world community and we should at least try to help others (that are willing and doing their best) on their feet. Don’t let your heart grow cold because someone tells you so. By the way, you can find more info about Nelo and his dog, he is not just a lazy pauper. @Joeam, I suppose your wife is a Balikbayan and therefor owns the property. If not, you made a mistake to begin with. If you don’t agree on eviction of her mother you can always report the crime to cops and have her arrested. Oh, and I know she is not cooking meth. Galing! Indeed, very nice read. I recently bumped into your blog and I can’t stop reading your posts, Ayos pampatay ng oras especially during hump days haha. Keep on posting! This entry was posted on October 9, 2014 by ikalwewe in Philippine society, Thoughts - Philippines and tagged kawawa, mentality, mercy, pinoy, pity.